Chasm is ranked in the 52nd percentile of games scored on OpenCritic. With a lot of similarly styled games on the market right now, the vastness and the creativity of Chasm makes for a really fun take on a popular theme. This world is a joy to get lost in and thanks to the unique take on procedural design, it offers a multitude of ways to re-experience the game even after completion. Aside from some minor issues with the ho-hum traversal upgrades, Chasm is an inspired take on a well-worn genre. If you long for the days of annual Igavanias, Chasm's one of the better modern stabs at that glory. Much of Chasm's appeal comes from the random nature of the adventure. The procedurally generated Metroidvania world creates a dynamic situation where combat and exploration are always surprising. Twisted confinements in this underground lair littered with all matter of dangerous creatures and environmental hazards form a deadly dance of evading and slashing. Some of the random environments can link together for vexing platforming challenges and lopsided enemy variety but the tension created by Chasm's chance placement means that nothing you encounter is expected. Chasm is a good Metroidvania game. But it feels like it could have been better at certain points. A game that took five years to develop feels like it should offer more than Chasm currently does. Is that an unfair assessment? Possibly, but then maybe you should ask someone who kickstarted it if they're happy with what they received after all these years. Chasm takes a stab at the action-platformer genre popularized by Castlevania and Metroid. It builds a good foundation, but flounders when it comes to making something unique and memorable. Chasm doesn’t quite have its own identity, as it borrows so much from other games. And, while it does that decently, it’s not best in class. The randomly generated level layout, which is the game’s one unique feature, actually ends up being its biggest weakness. Maybe I am being a little too unkind, as I did have fun playing, but I just feel like it could have been so much more and that’s what bothers me the most. 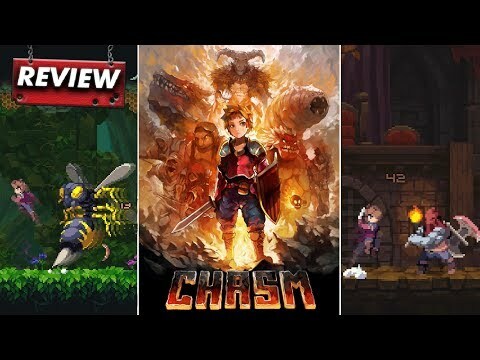 With underwhelming procedural generation, Chasm fails to stand out from other Metroidvania games due to its simple mechanics and somewhat bland setting. It's still pretty and challenging enough to be occasionally fun.